Officially known as Vizhinjam Lighthouse, this lighthouse is located on a hillock named Kurumkal which is very close to the sea. 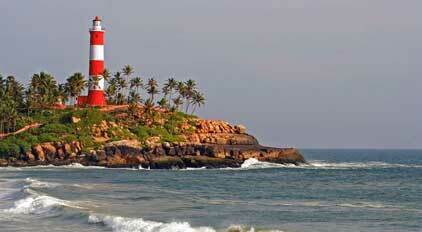 The lighthouse came into function in the year 1972 as Vizhinjam was then a busy seaport. This was later on modified in the year 2003. The southern end of the Kovalam beach is named after this hill house. The lighthouse is thirty five meter tall structure that is painted with red and white colour that is easily visible from a long distance. It is open to visitors and offers spectacular views of the lighthouse beach, Eve’s Beach and its surroundings. The Lighthouse road is a convenient venue for cycling and walks. The Karamana river crosses the highway at Thiruvallam, twelve kilometers from Kovalam. 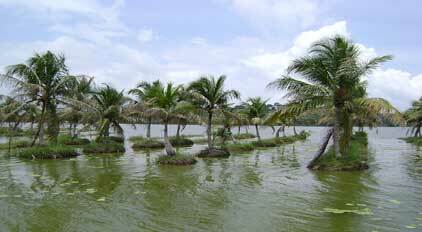 The place offers breathtaking views of the backwater and greenery. The Thiruvallam boat club, located on the bank of the river offers cruises, canoe rides, kayaking and houseboat cruises.The Peppara Dam and the Aruvikkara Dam are two dams that lie on this river.Its most famous tributary is the Killiyar which joins at Pallathukadavu. The Thiruvallam boat club located on the bank of the river offers cruises, canoe rides, kayaking and houseboat cruises. The timing of this is from 10 am to 6 pm. 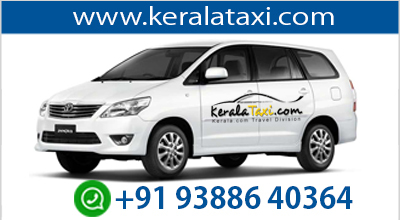 The place is located seven kilometers from Kovalam. There are boat services available from Kovalam. It is one of the few freshwater lakes in Kerala that looks enchanting in the moonlight. The Vellayani Lake is the venue of world famous annual boat race organized during Onam festival. The Vellayani Durga Temple is located close to the lake the specialty of this temple is that it allows only non-Brahmin priests. The saint then chanted a hymn and threw the pot away from where a big lake emerged gradually. It is this lake that is known as Vellayani Lake. 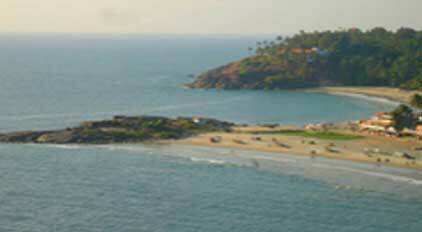 It is situated around ten kilometers away from Kovalam. 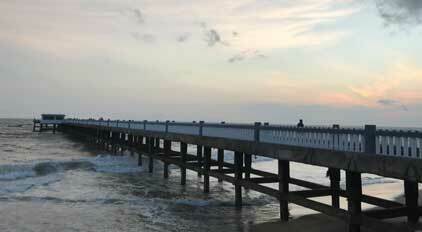 The coastline of this region up to Kovalam is visible from this pier. The Valiyathura literally means 'Big Port'. There is another port in this region named Cheriyathura, literally means 'small port'. This place offers excellent views of the setting sun and sea. Angling is the major activity here.It is a mesmerising view to watch beautiful fishes swimming in the waters, the fishermen doing their daily task of casting nets in the water and watching the waves that crash into the pier.This place is open from 10 am to 5 pm. The Kovalam art gallery in Kovalam displays artifacts, paintings and art works. The paintings in this art gallery consist of ancient Indian paintings related to the Sanskrit culture. Europe and Western artists and art lovers are the major visitors in this gallery even though there are other visitors also.Displays relating to the ancient traditions, heritage culture, Mughal era, Rajput era and many more from China, Tibet and Japan are found here.The main attractions here are the paintings of Raja Ravi Verma, Svetlova and Nicholas Roerich and some rare collections of Indian fresco paintings. 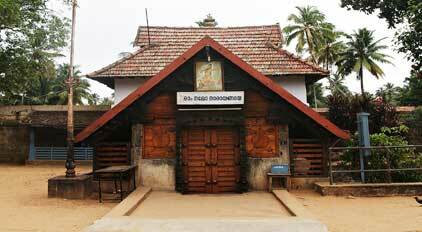 Thriuvallam Parashurama temple is located twelve kilometers from Kovalam. It is one of the major Hindu shrine, in India. 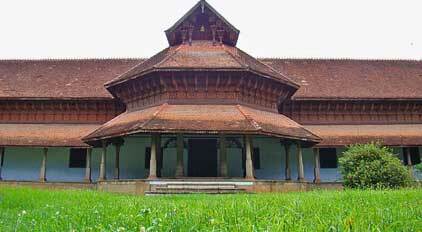 It is believed that this temple is about 2000 years old and is situating on the banks of the Karamana River. It is the exclusive temple that is dedicated to Parashurama,the mythological character who is believed to have created Kerala.The festival of Bali Tharpanam, which takes place on the day of Karkidakavavu, is one of the important festivals here. The another main attraction in Kovalam is Vizhinjam Rock Cut Cave Temple contains the rock cut sculptures of 18-th century. The temple is dedicated to Vinandhara Dakshinamurthi. The unfinished sculptures of Lord Shiva and Parvathy are also major attractions in this place.The place of Vizhinjam was earlier the capital of the chieftains of Ay. These people ruled some part of South India in the 8 th century. 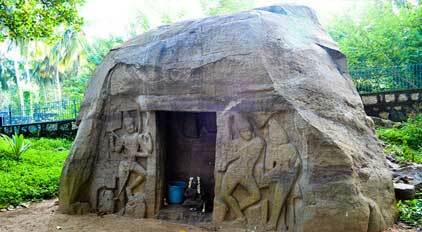 This cave is located at a distance of 3 kilometres from Kovalam remained unnoticed for many years.Open on all days from 9 am to 6 pm except Mondays. 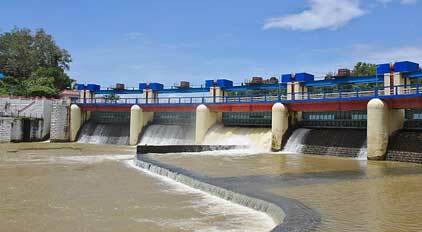 Aruvikkara dam is located ten kilometers from Kovalam. 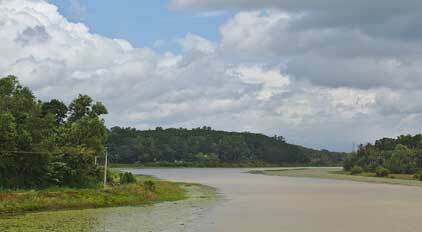 It is a beautiful picnic spot on the shores of Karamana River. The Durga temple and fish tank are the main attractions. Aruvikkara dam provides water to the capital city. The place is easily accessible by road.This lake water has a lot of fishes that come to the surface, making it suitable for the visitors to feed them. The common belief attached to this is that feeding the fishes can cure many diseases like skin allergy.This place can be enjoyed through boat rides that are available from 9 am to 4 pm and has a nominal cost between Rs. 100 to Rs. 200. 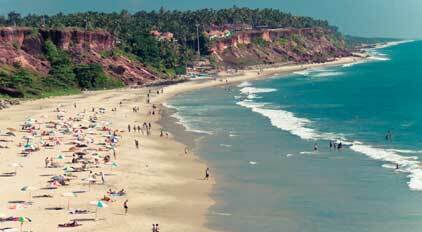 It is situated 90 Kms east of Kovalam. Kanyakumari is located at the southern most tip of India where the three water bodies, Bay of Bengal, the Arabian Sea and the Indian Ocean meet. Kanyakumari is famous for its spectacular sunrise and sunset. It is a famous tourist destination consists of Kanyakumari Temple, Gandhi Smarak Mandir and Vivekananda Rock There is a boat ride service from the beach to the Vivekananda Rock. 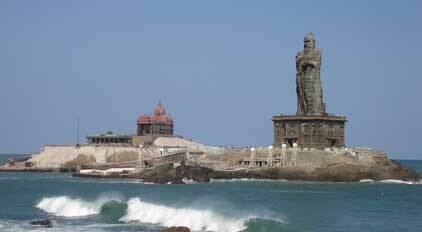 Kanyakumari is located in Tamil Nadu.Thisplace is named after the Devi Kanya Kumari, who is believed to be the sister of Lord Krishna. During the British Raj this place was named as Cape Comorin.